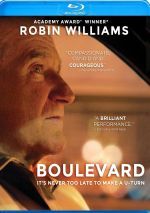 Robin Williams’ long, noteworthy film career comes to an end with 2015’s Boulevard. Nolan Mack (Williams) leads a nondescript life, as he’s worked the same bank job for decades and has been married to wife Joy (Kathy Baker) for years as well. A few complications enter his world, though. For one, Nolan’s elderly father requires intensive care. In addition, Nolan suppresses his homosexuality – until he almost hits street kid Leo (Roberto Aguire) with his car. The pair get to know each other, and this upends Nolan’s mundane existence in a variety of ways. It can be tough to evaluate a film like Boulevard because of the baggage that hangs over it. I find it hard to examine it on its own merits, for its existence as Williams’ last effort brings a certain level of expectations. One hopes a final flick will stand out as something memorable and above average. This becomes especially true due to the construction of Boulevard. 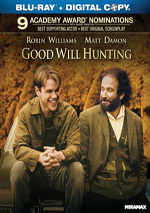 Williams’ last film doesn’t feature him in a supporting role. Not only does Williams play the lead here, but also he dominates the running time. Nary a scene takes place that doesn’t involve Nolan, so much of the burden for the movie’s success lies on Williams’ shoulders. Because of that, I’m happy to report that Williams does a good job – indeed, he helps elevate largely pedestrian material. At its heart, Boulevard lacks much meat. It tells a story that doesn’t seem especially fresh, and it doesn’t bring a ton of insight to the subject matter. Boulevard often feels like a play adapted for the screen. It comes with only a handful of locations and something about it comes across as “staged”, such as when Nolan delivers a monologue about when he knew he was gay. The dialogue can seem forced and unnatural. Despite all that, Williams does pretty well in the lead and creates a character who becomes more interesting than probably should be the case. My only minor quibble comes from occasional glimmers of “Comedian Robin Williams”. I don’t think Williams should have played Nolan as a totally humorless character, especially because Nolan’s asides/cracks hint at the life he could have lived. That said, I’d have liked Williams to go for a comedic vibe that differs from his usual personality. I don’t want to overstate this side of Williams’ performance, as he doesn’t ever come close to wacky, over the top mode. Still, there’s a “Robin Williams” feel that seems a bit out of character for Nolan. Otherwise, Williams hits the right notes. He gives Nolan the right sense of repression and feels believable when Nolan slowly stirs to life. Williams avoids the smug sanctimony that mars some of his roles, and he offers a convincing, involving performance. I just wish I liked the rest of the movie more than I do. Not that I find real fault with Boulevard, as it delivers a reasonably engaging and involving little drama. Without Williams’ solid lead performance, though, it would’ve worked much less well. Boulevard appears in an aspect ratio of approximately 2.40:1 on this Blu-ray Disc. The movie came with a positive presentation. Sharpness was solid. Only a smidgen of softness ever occurred, so the majority of the flick offered strong delineation. No issues with jaggies or shimmering occurred, and the presentation lacked edge haloes. In terms of source defects, I witnessed no specks, marks or other issues; the Blu-ray gave us a clean transfer. In terms of palette, Boulevard went with Hollywood Standard teal and orange. That seemed like a lackluster choice, but I couldn’t complain about the execution of the tones, as they seemed fine. Blacks appeared dark and dense, while shadows showed decent clarity. No notable issues occurred here. As for the film’s Dolby TrueHD 5.1 soundtrack, it remained pretty low-key. General ambience ruled the day, as little more exciting than that appeared. Street shots offered decent breadth, and music spread well to the side speakers. Nonetheless, nothing especially lively popped up here. Audio quality seemed acceptable. Speech appeared natural and concise, as the lines always remained intelligible. Music seemed full and rich, while effects showed good accuracy. Nothing here stood out as particularly memorable, but the track was fine for a film of this sort. No extras appear on the Blu-ray – not even any previews for other releases. As Robin Williams’ final film, Boulevard doesn’t let the actor fully go out on top, but I don’t blame him for the movie’s weaknesses. Williams provides an effective performance in a flick that lacks consistency. The Blu-ray offers good picture and audio but lacks any bonus features. While I don’t think Boulevard becomes a great film, it deserves a look for Williams’ work.